The title of this post pretty much sums up the project. 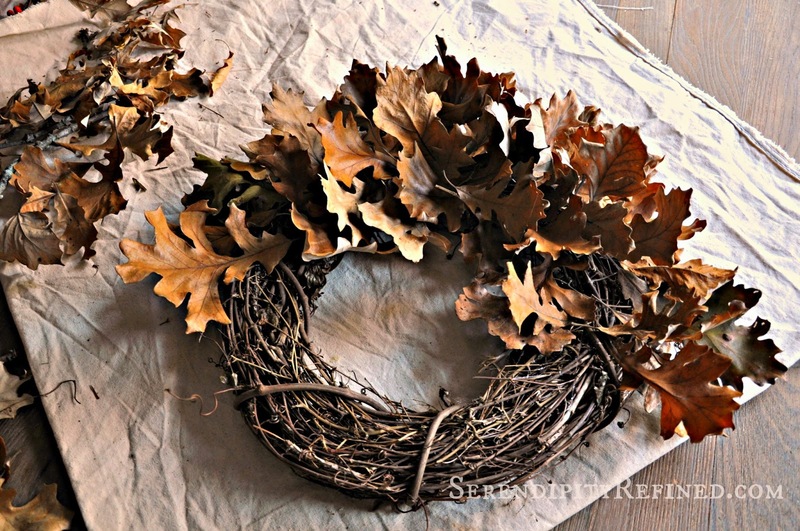 It's a super simple, free (if you have grapevine on hand) DIY wreath that I made from oak leaves that fell in my yard. It's a little rustic but it's perfect for the farmhouse. I live at the edge of an old oak grove. I walk almost every day in the very early morning just after the sun has risen. Morning has been my favorite time of day since some time just after college when I realized that I'd actually need to get out of bed before noon and go to work. Now, I like the early morning because it's light enough to scope out (and haul home) cast off furniture on trash day or to gather pine cones, acorns, (and anything else that either Mother Nature or my neighbors have thrown away that I may be able to repurpose) without anyone seeing me. It's also a chance to get a little exercise before my brain wakes up enough to fully understand what's happening. A word of caution from someone who has learned the icky hard way: When using natural materials that you've gathered, bake them in the oven at 200 degrees on a cookie sheet lined with foil for 20 minutes to kill any visitors that my have taken up residence in whatever it is that you're using. 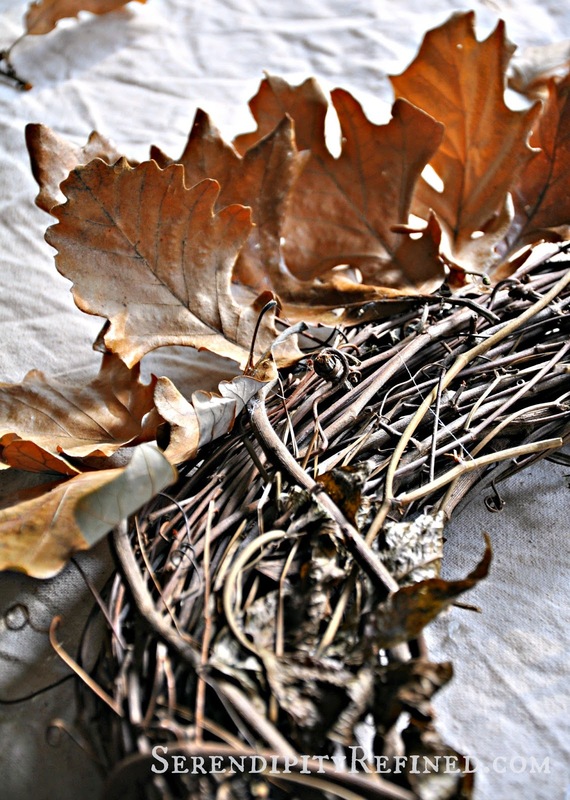 This is especially important when using acorns and other nuts and seeds as many of them are hosts for the larvae of insects and other small friends that you probably don't want paying a visit to your home. 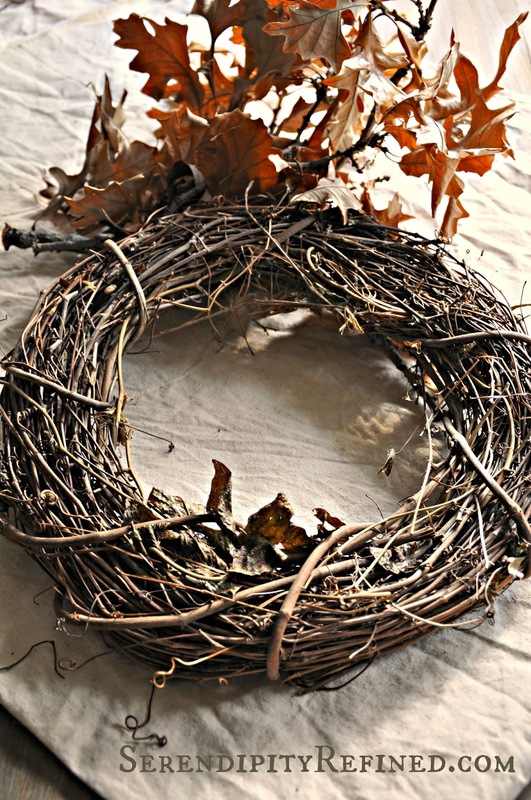 To make this wreath I used were an 18 inch grape vine wreath, a pile of leaves that I collected, and some hot glue. That's it. 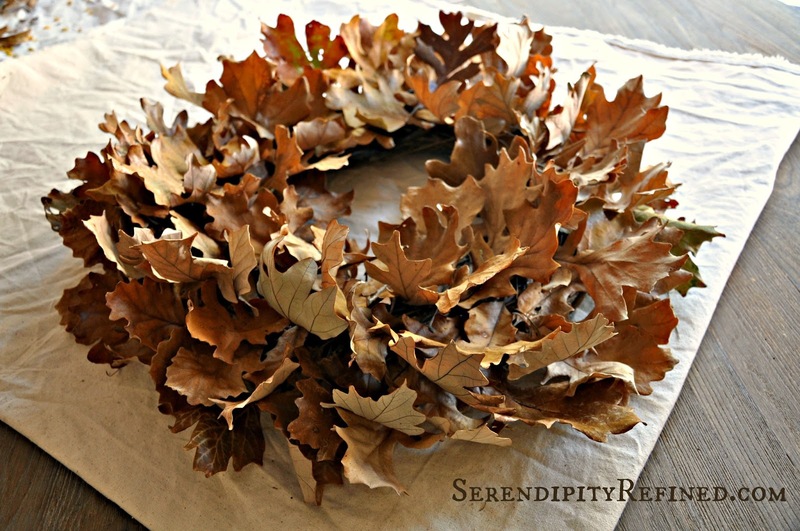 Glue the leaves onto the wreath in a random fashion. Make them all, "willie nillie and catty-wampus" as my Grandma used to say. There's no right or wrong way to glue them. 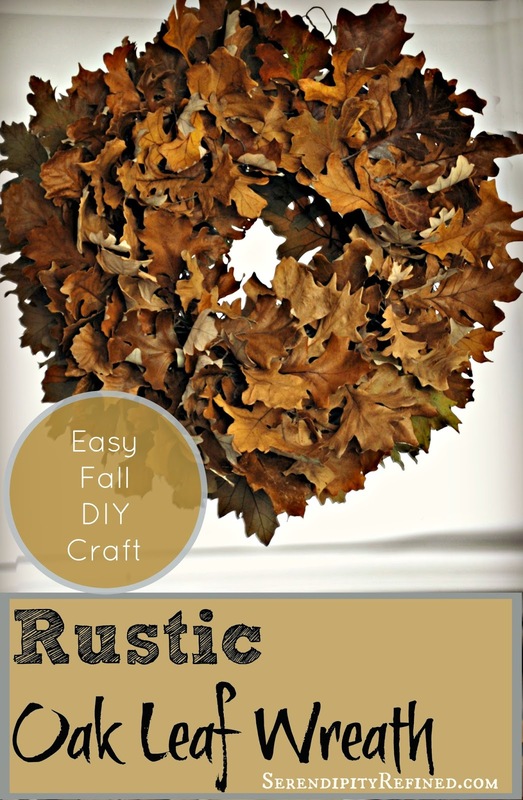 Keep gluing, and overlapping, and adding leaves until you think that it looks finished. When you do, it is. 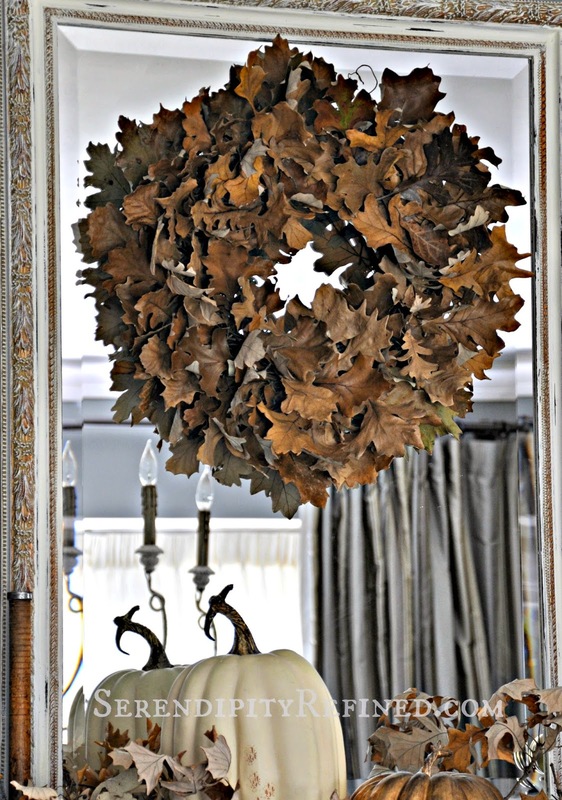 When you've finished, hang up your free oak leaf wreath. 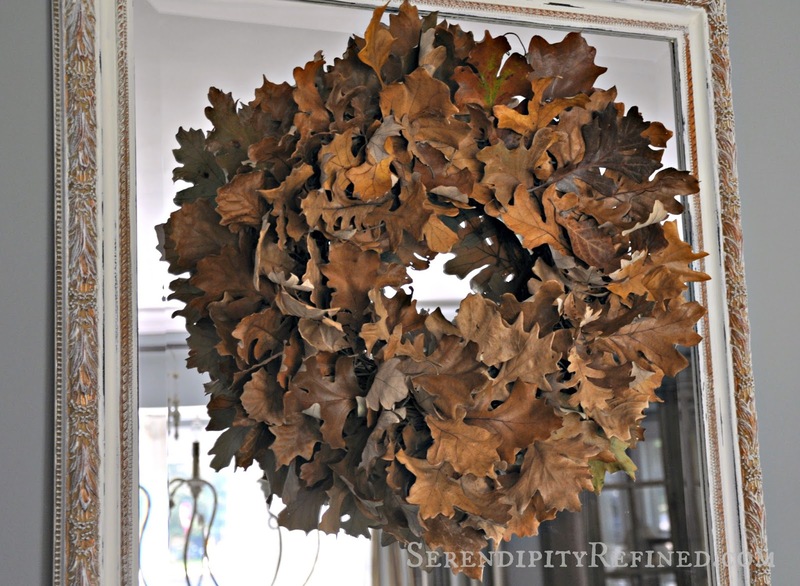 Stand back...admire your work... contemplate making a companion wreath from maple leaves. Question whether or not you should add acorns...or a bow. 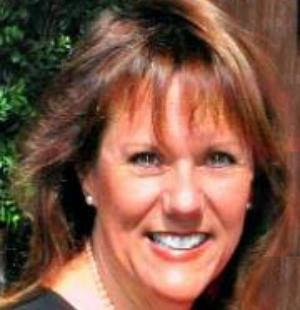 Decide that you should probably just finish your mantel and get back to your day job. 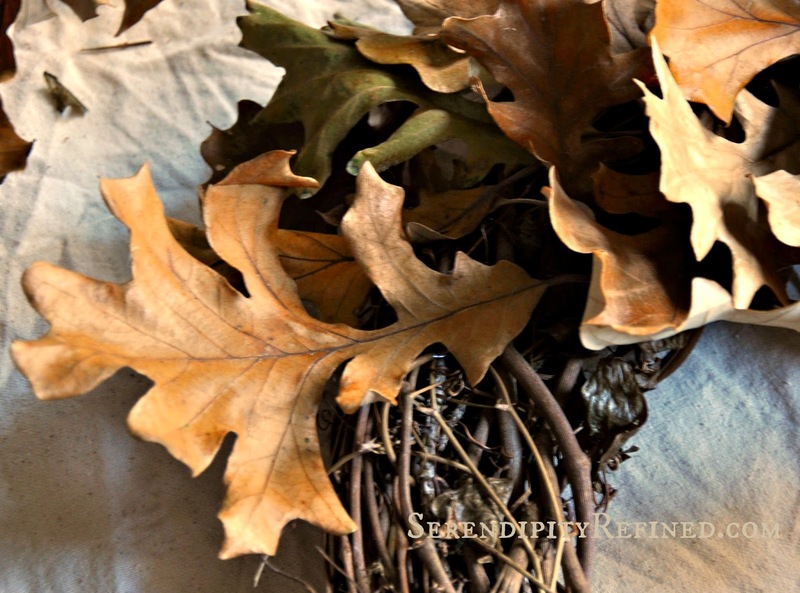 P.S Click here if you'd like to see the rest of my rustic, neutral fall mantel.